You know, usually I like to start with a bit of an intro or anecdote before jumping into these recaps. But really, all I came up with for this week was when I was little, my sister used to play this game in the pool where she pretended to be George Washington. It’s Betty Ann’s turn. She’s a fun, twisted little one. Her story is about the the strangers amount us, those who we see every day but maybe don’t know as well as we think we do. Brother and sister Billy and Karin like to play on the empty thirteenth floor of their apartment complex. Karin, who is adopted, lacks her brother’s sporting abilities. He’s agile and has great hand-eye coordination. And Karin…well, lacks. While playing hockey on the abandoned floor one day, the room begins to shake and the siblings see a bright flashing light through the windows. The two decide to leave, but when they reach the elevator, they see that their usual elevator operator has gone and has been replaced by a tall man in his best Black Lodge outfit. That night, Karin’s television turns on by itself. A man appears telling Karin that “they came for a little visit”. 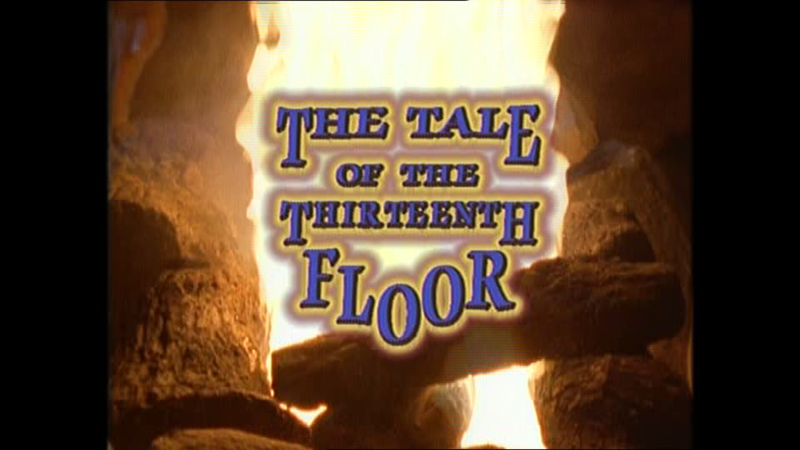 The girl shrugs it off, thinking she’s having a dream, but in the morning, she and Billy are told that new tenants have moved into the thirteenth floor and they can no longer play up there. Karin receives a letter without any postage or mailing address. Inside the envelope is a invitation for her to visit the new Toy Factory that has opened up on the thirteenth floor. She seems a bit reluctant because the games are all sports-related. But Billy insists that she goes – and brings him with. Again while Karin sleeps, the television turns on, begging Karin to go to the factory. In her sleepy state, she agrees. In the morning, Billy and Karin go up to the top floor together. They find in place of the empty, dusty room is a brightly-coloured maze of toys. Billy and Karin are greeted by Olga, who looks less than happy that Billy has joined. Olga tells the children that they need only one child for testing, but Karin insists that Billy stays or she leaves. Olga reluctantly agrees, and leads the children into a room filled with more games and toys where the man from Karin’s “dream” awaits them. The man, Raymond, looks as annoyed as Olga when he sees Billy. But nevertheless sits the children down to a sort of Simon Says-style game. Karin loses the first few rounds to her brother, but after each round, Raymond turns a wheels. Billy gets slower and Karin becomes more agile. When Karin wins the game, she is brought to the next game while Billy takes a snooze on the Simon Says game pad. In this game, Karin is strapped to a chair. Raymond tells Karin to move a ball on the other side of the room with her mind. Karin, clearly thinking it’s a bit silly, tries any way and succeeds. Raymond turns the wheel again, and it begins to hurt Billy. Karin protests, but Raymond says she needs to get used to the atmosphere so she can be sent back to the ship. As Karin tells him she doesn’t want to go, Raymond removed his face revealing a blank alien face. Freaked, Karin tries to wake Billy to escape with him, only she finds he is unresponsive. She uses her new telekinetic powers to escape from Raymond. She freezes Raymond with a button from the control device she finds. Though while hiding in the air duct, she’s discovered and chased by the un-frozen Raymond. Karin finally manages to get to Billy and begins dragging him through the factory. When they get to the elevator, they’re stopped by the elevator operator. He tries to persuade Karin that she needs to leave on the spaceship. She still declares that she doesn’t want to go. Meanwhile, Olga and Raymond panic. They have only so much atmosphere left until they will be forced to leave Earth. They continue to try to get Karin to join them, but she eventually escapes with Billy. The brother and sister collapse in Karin’s bedroom, where the television turns on by itself yet again. Olga appears and says that they were only trying to rescue Karin, who had been left behind on Earth 10 years before. They needed 10 years to gain enough atmosphere to go to Earth, and it will be another 10 years before they can come back and try to save her again. Billy looks to his sister and asks what Olga is talking about. Only Karin doesn’t seem to be there anymore, but a face-less alien sits in her place. This was a fun little episode. It’s certainly one of the more ambitious ones, trying to set up an entire alien reality in less than 20 minutes. The twist ending is pretty great, too. Though I’m not entirely convinced of Betty Ann’s message. Be careful because adopted kids might be aliens?